A favourite past-time and break activity of mine is hitting the random article link on Wikipedia. Yeah try that and you'll discover something interesting that you, in all probability, never heard of before. 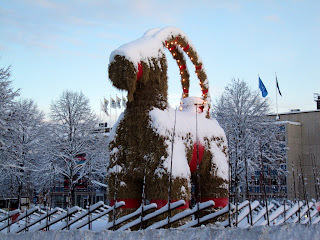 Today morning, it brought up the interesting & amusing feature of the Gavle goat. In 1979 the goat was burned even before it could be erected properly. In 1988 British bookmakers start betting & booking business on the fate of the goat. In 1996, webcams were introduced to monitor the goat. Still there was no luck. These webcam feeds on the homepage were hacked in 2004. In 1998 its a severe snowy storm and guards guarding the goat take some minutes off to have coffee. Before they could sip coffee, they see the goat burning bright. In 2001 one fellow is arrested for burning the goat, but escapes the country before paying his punishment fine. Even a goat committee has been formed which supervises the construction & erection of the goat to prevent attempts at vandalism. This included fireproofing the goat and various other structural reinforcements to avoid damage. Even a "shoot at sight" order was issued for Santa Claus clad vandals who had torched the goat with flaming arrows earlier. and so on it goes on.. makes for very interesting reading. This has definitely added to the tourist potential of the place. Why not .. If at all I get to visit Sweden someday, I'll definitely love to visit this place and hear firsthand accounts of this wonderful goat tradition.